Jean-Pierre Goffin: Could you summarise your journey from classical music to jazz? J-PG: Which versions were your favourites? FH: There were Miles, Bill Evans Ahmad Jamal, Oscar Peterson… I can’t remember, there was Sarah Vaughan, too. I loved them all, I listened to them and worked. Afterwards, I started to play gigs with all the guys… They were very nice. J-PG: Was Cincinnati a very active place at that time? FH: Most of the cities in America had quite heavy-weight piano players or sax players. There was no education program then, so young people were not really interested in jazz. I learned accompanying singers and all kind of skills that were very important to me. And I decided to get out of it and left for New England where Jaki Byard was teaching. I followed lessons with him for one year and I also had a teacher for classical music… Gunther Schüller was there, too. J-PG: Did you go on with classical music - just for the technique? FH: No, I loved the music. New England was one of the best Conservatories in the world and I decided I wanted to take advantage of that and play chamber music, play in different ensembles. Many musicians in my class were very successful: Michael Moore, John Harris, Anthony Coleman, the bebop piano player Mike LeDonne… We were all in the same class, a very special group and we learned a lot from each other. As soon as I graduated I moved to New York, 40 years ago now! J-PG: That’s where you met Joe Henderson. FH: Well, it was more complicated than that. I first started playing at parties and in restaurants. Then I played a lot at Bradley’s, that the venue where I started playing with Sam Jones who recommended me to Art Farmer who had Joe Henderson as a guest. Also there were not so many young jazz pianists like me who knew a lot of tunes, who could swing, accompany, play in different styles. So I was a bit like a sort of novelty at my age, pretty well developed… I am finishing a memoir which will be released in September 2017 called Good Things Happen Slowly, I am doing the final edit now. I write about the time when I met Mingus, the time when I heard Miles Davis live and all these wonderful experiences I had, what Joe Henderson was like as a person… I try to paint a picture for someone who doesn’t know much about jazz, why this music was so fascinating. Also, I am very deep into the story of who I am, including my health problems. There is also a new film about me which is good… I am sorry to say that Let Yourself Go was not very good, but this one is really beautifully done. It is called The Ballad of Fred Hersch and it is going to be shown in film festivals. J-PG: Could you speak about the birth of your first trio? FH: My first trio was with Marc Johnson and Joey Baron, we made our first album in 1984, we also played with Toots Thielemans on Ne Me quitte pas and also Only Trust Your Heart which I produced. Then for my second trio I had Charlie Haden and Joey for a new recording, but we never worked on tour. The third trio was with Drew Gress and Tom Rainey; that one lasted a long time, maybe 10, 12 years. Then I started looking for something different for the drums and from a recommendation I heard Nasheet Waits. We made a couple of records, but Drew began to be very very busy and I knew John Hebert and shortly after came Nasheet’s best friend Eric McPherson ,and we have been together for seven years. I think it is my best trio, I have never had a band I feel so comfortable with. We can play any kind of music. We got two Grammy nominations two years ago. People recognise the particular sound of this trio, not because of me but because of the sound of the band. J-PG: Do you compose differently for the trio or for playing solo? FH: Yes, I know the pieces I compose for a solo or a duo, pieces I know I will use the low chords of the piano in a certain way. There are other pieces I definitely write for the trio and other things I write for the trio plus two, pieces I never play in another context. But sometimes you compose a new tune for the trio and the guys like it or not, it works or it doesn’t work. On Sunday Night At The Vanguard there is a tune called The Optimum Thing, a kind of counterfeit of The Best Thing For You by Irving Berlin and I couldn’t decide what tempo I was going to play, so we played it on every tempo: we started slowly, randomly and gradually it became faster… You know we seldom rehearse - maybe twice a year - but we have a lot of work on tour. In the States we are fairly busy and every concert is a rehearsal, some pieces evolve, some pieces we play for a while and then we let them go, and other pieces come in… You don’t want to release perfect sets, there are pieces you are familiar enough with but you don’t have all the performances in mind and think: the last time was perfect and I want to do that again… You need to be familiar with a tune but you want to explore more and more. FH: I love live recordings! You know maybe there is an occasional note which is not perfect but it is the best reflection of what I really do… The microphones are there and you just play, it is the most honest thing. Young players don’t have the experience that I had listening to Tommy Flanagan 30 times, and some of those nights he was not playing so great… Joe Henderson, too. Some nights he wasn’t so inspired at the beginning of a set but he would be patient and find it, then he was going to the fifth gear and it was amazing. Young musicians have a distorted image of music on CDs andYouTube, they are not able to sit and feel the things. They use Spotify and they listen to Miles, Red Garland, Herbie Hancock, but they don’t try to learn more, there is no notification of where and when it was recorded, who else is playing… They don’t have the passion to seek out the real stuff. J-PG: There is a great variety of tunes in your repertoire: you play Schumann, Monk, Paul McCartney, Joni Mitchell… How do you make these choices? FH: These songs are not only beautiful pieces of music but the lyrics are important to me. It is very difficult to play a song when I don’t like the lyrics… like Polka Dots And Moonbeams, the melody is beautiful but the lyrics are awful , so I never play it. There is a famous story about Lester Young who was in the middle of a melody in a studio and he stopped and the engineer asked him why he stopped and he said he forgot the words. Young musicians are very far from that… I have to play things I am connected to. Sometimes I don’t play some songs anymore, and five years later they are fresh once again. 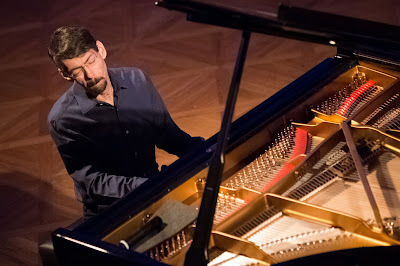 “FH: It’s not conscious, it is part of the language of the piano; it is creating new textures, but it’s not a kind of “jazz meets classical”, some influences come for the trio, some for the solo performance, some for the duo, and of course I’m very influenced by who I’m playing with. It’s different if I’m playing with Julian Lage, Ornette Coleman or Michael Moore: they all bring out different parts of me. That’s why I play jazz, you know! J-PG: There is a piece dedicated to Benoit Delbecq: Calligram. Could you explain the origin of this piece? FH: We did a project and an album called Fun House, a fascinating project: two pianos, two bass players, two drums, electronics, and in Benoit’s part some prepared piano with different stuff, pieces of wood… Benoit is very influenced by Ligeti and pygmy music. I think he is a genius and also one of my favourite people. I like writing tunes for other people - I have written 40 of them - and the melody for Benoit came out very quickly with some of the things I know he likes. It is not an imitation, but an homage. John Hebert also played a lot with Benoit so it was natural to write something for him. It is just a little melody and it becomes very open. J-PG: Do you have any duo projects planned? FH: There is an album coming in 2017 with Anat Cohen, recorded in California. And every May for the last ten years I have done a duo invitation series at the Jazz Standard in New York: six nights with six different guests. That makes about 40 different guest in 10 years. It is developing organically, sometimes you have good feelings… The only way I play with a singer now is in duo: Norma Winstone, Kurt Elling, Cecil McLorin Salvant… I’m really interested in people who give and take, share… I love the sound of piano and voice, I love words. J-PG: You love literature: you had a project called "Leaves of Grass". FH: Yes, and we are going to play it live for the first time in September 2017 for the release of my book. Walt Whitman’s words are very inspiring, he was one of the greatest philosopher/poets, very American in a good way. At this moment people in my country should read words like this. It is horrifying and getting worse every day in the States… It is very depressing and one of the nice things of being on tour in Europe is that I don’t have to look at the New York Times every day. I can work on my book, be quiet, not be in the middle of it. J-PG: Do you know the piece you are going to start with this evening? On that night, Fred Hersch played: Improvisation followed by Portrait In Black and White (AC Jobim), West Virginia Round (Hersch), Down Home (Hersch’s homage to Bill Frisell), Songs Without Words Part 4 (Hersch), Both Sides Now (Joni Mitchell), Everybody’s Song But My Own (Kenny Wheeler), You’re The Top (Cole Porter), The Wind (Russ Freeman), Moon and Sand (Engvitz/Palitz/Wilder), The Nearness of You (Carmichael/Washington), In Walked Bud (Monk), Mood Indigo (Ellington), and Valentine (Hersch). LINKS: The interview is on CitizenJazz and we will link to the Jazzaround piece shortly.